The new cabinet comes one month after Maduro’s landslide reelection victory on a platform promising strong measures to resolve Venezuela’s ongoing economic crisis, marked by hyperinflation, falling oil production, and shortages. Upon presenting his new team, the president pledged that they will work together to “boost the economy” and increase efficiency in his governance. “We are going to create a system of ministerial measuring by results obtained per month in each work area. This will help us create an efficient government,” he stated. Despite claims of new direction–featuring two new ministries, ten new faces, and the incorporation of representatives of two other political parties into the cabinet–critics have pointed to a great deal of continuity, with the majority of new ministers coming from existing circles and very few representing new ideas or positions. Meanwhile, other analysts have highlighted the increased proportion of civilians in the cabinet with military officials dropping from 44 percent to 27 percent of ministers. “I am very content because of these twelve new faces, seven are women,” he stated. However, the number of women remains low with only nine of the expanded forty-three strong governmental team–21 percent–being female, up from the even lower 8 percent in the previous cabinet. The most prominent addition to Maduro’s team was former National Constituent Assembly (ANC) President Delcy Rodriguez (49) who was named Executive Vice President. Prior to her powerful position in the ANC, Rodriguez served in both the cabinets of President Maduro and his predecessor, Hugo Chavez, holding positions such as chief of staff (2006), communications minister (2013-2014), and most famously as foreign minister (2014-2017). Following her departure from the ANC, the body is due to hold new leadership elections. Many are critical of Rodriguez’s tenure at the helm of the body and point to a lack of progress in the rewriting of the constitution. Viewed as a key ally of Maduro, she was member of the United Socialist Party (PSUV) until January this year when she assumed the presidency of the independent Somos Venezuela movement, which achieved 369,000 votes (4%) in the last elections. “I have appointed a young, brave woman, the daughter of a martyr and revolutionary, tested in thousands of battles,” proclaimed Maduro in reference to Rodriguez. Apart from Rodriguez, Maduro also made the surprise announcement of the inclusion of Tupamaro’s Hipolito Abreu (49) as transport minister. Abreu, who is organisational secretary of the small revolutionary organisation Tupamaro, presided over Venezuela’s Rail Institute and is an engineer by trade. He is the first non-PSUV minister from the Great Patriotic Pole coalition of pro-government leftist parties. Despite Tupamaro being small in numbers–they won only 1% of the vote this past May 20–they are renowned for having significant influence in the street collectives and community groupings, and many consider the naming of Abreu to be a concession by Maduro to his political allies and an opening up to a more diverse selection of political positions in his government. Alongside Vice President Rodriguez are a number of other new female additions to the team, including ex-Governor of Falcon State Stella Lugo (52) who will head the Ministry of Tourism; ex-Governor of Aragua State Caryl Bertho (54) who takes on the Women’s Ministry; and the former tourism minister, civil engineer, and wife of PSUV Vice President Diosdado Cabello, Marleny Contreras (55), who is the new public works minister. Equally, Maduro has bought in Mayerlin Arias as minister of urban agriculture. Arias previously served as the president of the Robert Serra Youth Mission and is seen to represent the youth sector. “The youth and women are the hallmark of this new beginning. A new young socialist leader, Mayerlin Arias, embodies the role of new generations for a better future,” wrote Maduro upon naming her for the post. As minister of foreign trade and international investment, Maduro named architect and previous vice-minister for finance, Yomana Koteich (52). Koteich was previously president of the Agricultural Bank of Venezuela, and has also worked as president of the Venezuelan Tourism Corporation, before heading the contentious temporary state intervention of Venezuela’s largest private bank, Banesco, in May. 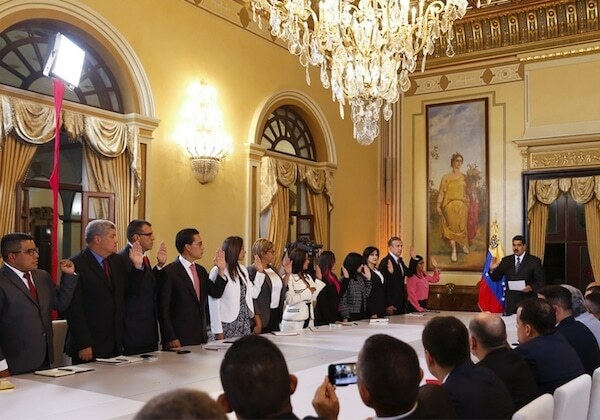 Apart from the nine new ministers, Maduro also created two new ministries, bringing the total to 33. The first–the Ministry for Water–will look to address the phenomenon of increasingly frequent water shortages in Venezuela and will be under the auspices of the ex-president of Caracas’ water board, Evelyn Vasquez. A controversial figure, El Aissami appears to have strengthened his position in the new cabinet, taking almost sole charge of economic affairs and having secured appointments for key allies, specifically Rivas, who studied alongside El Aissami and Bertho who worked under him when he was Aragua governor. Equally, Koteich worked closely to El Aissami in the state intervention of Banesco which was inspired by the new industry and national production minister. Meanwhile, a number of key ministers were reaffirmed in their posts, including Communications Minister and brother of Delcy Rodriguez, Jorge Rodriguez, Foreign Minister Jorge Arreaza, Culture Minister Ernesto Villegas, Interior Minister Nestor Reverol, Education Minister Elias Jaua, Defense Minister Vladimir Padrino Lopez, Communes Minister Aristobulo Isturiz, as well as Food Minister Wilmar Castro Soteldo.